Hello! My name is Jason and three years ago I spent 11 months living on a farm as an exchange student with a wonderful family in the mountains of Norway. I participated in a program through Youth For Understanding. I left America in August, 2000 for my new adventures in Norway! The first week in Norway, I attended a culture and language camp with other exchange students from around the world. Then my host-parents welcomed me into their home, and I attended Stryn Vidaregåande Skule with my host-sister, Marita. The experience was awesome and life-changing, and I would like you to see just how it was. So, please take a look aorund and enjoy all my site has to offer! Norway is the land of beauty at its purest. 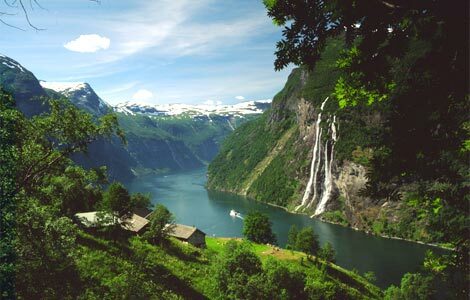 Crystal-clear lakes and breathtaking fjords cover the land, while huge mountains peaks touch the sky. If you look hard enough, you may just spot a troll racing under the trees. Take a look at my Photo Gallery to see other beautiful photos! Folklore and tradition play a vital role in the everyday life of Norwegians. Whether it be the spoken language, the food or the style of dress, Norwegian are know for their uniqueness. Sagas, legends and stories of Vikings are passed down through children's books and through the tales of grandparents. Christmas, or the Yul tide, is a very special and warming time for Norwegians and is often spent with family in a home full of decorations. Check out how I spent my Christmas here Click Here.